Thanks for everyone who has got in touch; I currently have a lot items on my list. If you want me to have a go at finding an item for you please get in touch via Formspring and I'd be happy to help! Please keep in mind that i won't be able to find everything you suggest, there are certain limits on eBay that even i can't get around! Those friendship bracelets are awesome. They look nice and sturdy! 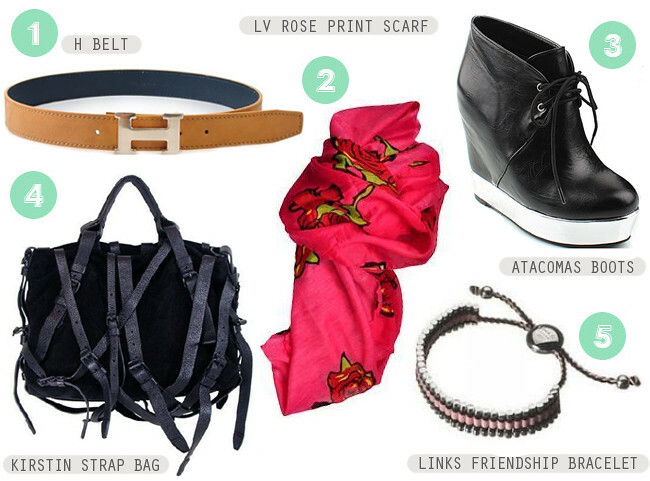 LOVE the Hermes belt and the LV scarf. Cannot wait for my loan to come through, not soon enough! I get so excited when I see one of these posts from you! I really appreciate you spending the time looking for these bargains! thank you for posting these links! just purchased a bracelet! The friendship bracelet is cute, they have a lot of them at Urban Outfitters! My friend also made me one similar to that just without the extra bulb thingy in the middle. I used to wear it everyday until it got too loose. Great blog btw! The boots are absolutely amazing! OMG, the bag is awesome!!!! I really love those boots, the bag is nice too but I bet I'd get myself hooked onto everything I passed! I absolutely loooove reading your Ebay posts, it helps you look super trendy at the same time as saving a lot of pennies! So tempted to get the bracelet! I also do this alot! My latest bargains were some leopard leggings and a quilted jacket. Really interesting post. Good work!